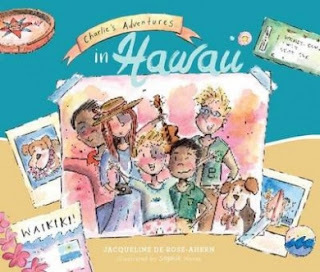 Two of my favourite things in the world are children’s picture books and holidays in Hawaii, so I was utterly delighted to read Jacqueline de Rose-Ahern’s new children’s book, Charlie’s Adventures in Hawaii. When Charlie and his family visit friends, Kai and Amoka, in Oahu Hawaii, young Charlie and Kai set off together to locate the clues that lead them to uncover the Aloha spirit. Each clue helps Charlie learn a new Hawaiian word, together with its meaning. From climbing Diamond Head, to surfing Waikiki or enjoying a Luau feast, Charlie’s Adventures in Hawaii not only gives readers insight into the delights that this island has to offer, but also introduces children to a new culture and its people. Sophie Norsa’s illustrations are quirky and clever, complementing Jacqueline de Rose-Ahern’s strategic text. With your very own map to keep in the back of the book, Charlie’s Adventures in Hawaii is a gorgeous publication….with the exciting hint there are more adventures to come.